Weather is a strange science, there is no denying that. There are so many variables that it is a wonder that forecasting is as accurate as it is, well, at ground level anyway. You can, in the main, see weather but what you can’t see are thermals. Well, you can sometimes see their effects but ‘seeing’ thermals is tricky. Understanding them and how they work is also a pretty inexact science. Its fair to say that, for many, a thermal is envisaged as a column of rising air created by surface warming. Well it sort of is, or may be. As my dad was heavily into gliding I was told about them before I was really paying any attention to anything very much, let alone the weather. By age eight I was looking at little puffy clouds with glee and Cu-nimbs with despair that a downpour was imminent, brushed with the excitement of an impending thunderstorm. We’d build model gliders and were soon losing a few as we got the hang of launching into them (thermals not cu-nimbs!). Fortunately we discovered de-thermalising fuses for the gliders so lost fewer to thermic activity but more to in-flight fires. Rustling trees and bushes, little miniature dust devils and soaring birds, whirling dervishes moving across the top of a crop or a change of temperature as you pedalled down the road, we even had a streamer on a stick and I soon learnt all these things pointed to the existence of thermals in one form or another. Books and papers galore have been written on thermals and their properties. Some are pretty simple, others amazingly complicated. 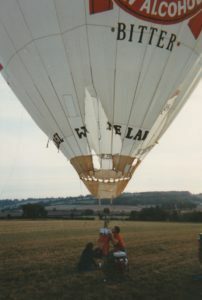 In gliding we love them, in ballooning we avoid them, or rather we should! Basic training tells you that a hot air balloon is a thermal in a bag. If that ‘bag’, trundling along straight and level, runs into a pocket of warmer air it will sink as the temperature difference will narrow. If it hits colder air it will climb. If it runs into a strong enough thermal it may well be carried upwards. Now you have a ‘heavy’ balloon going up which will soon be coming down again. 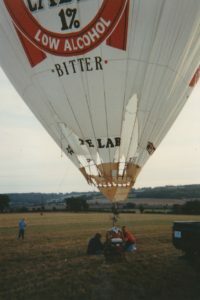 You are now in a dilemma as you don’t want to go up but you don’t want to appear out of it in a well-cold balloon. Thermals can also produce quite exciting turbulence both at ground level and all the way up so you’ll probably have s seriously distorted envelope into the bargain. 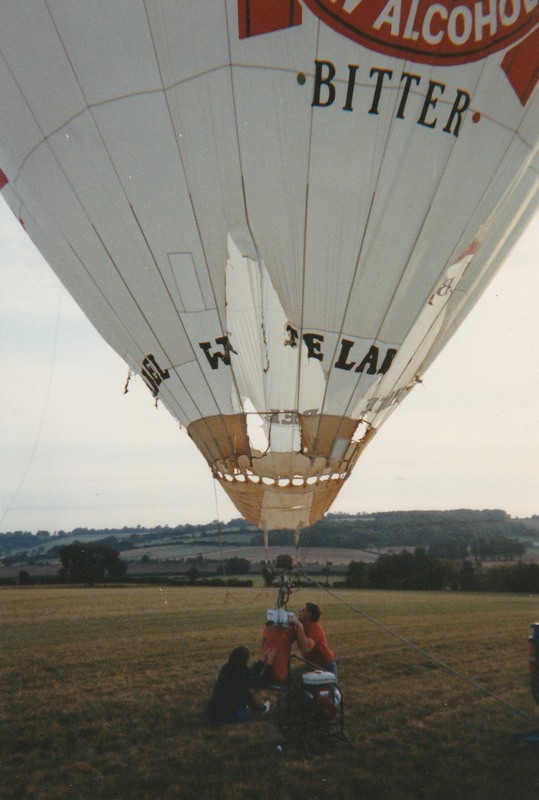 Pretty quickly you will understand why balloons don’t go thermalling and if you trouble to read the Flight Manual it will basically tell you, ‘Don’t do it!’ Basic rule is that balloons fly when gliders don’t. 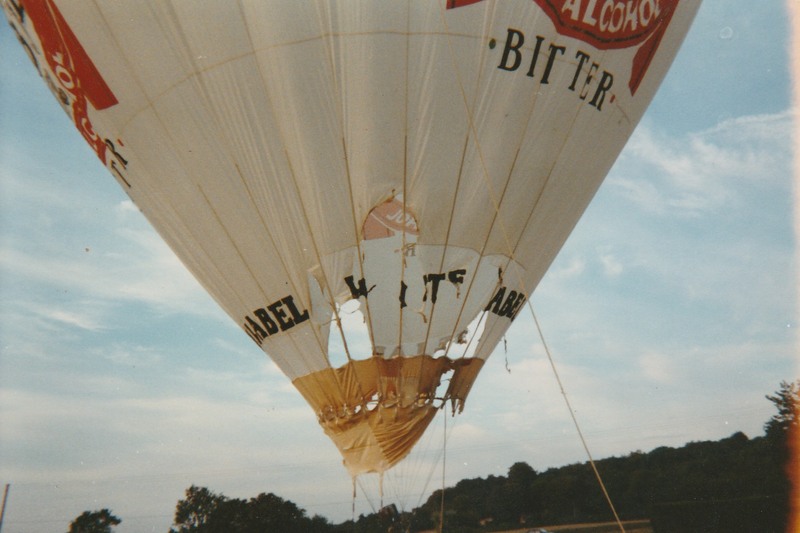 The history of modern hot air ballooning tells a different story. In the beginning the thermal versus unstable air equations were, if not fully understood, largely ignored. It didn’t take long though before it was realised that flying before things warmed up and after they’d cooled down was a good idea. A question on thermals appeared in the first exam papers. ‘What time do thermals start?’ the answer taught being, ‘10 o’clock’. Well that may be the stock answer but the truth can be very different, especially in warmer countries. In reality thermal development depends very much on the overnight temperature and the predicted temperature of the day. In these days of global warming the season might run from mid April until September and it is not uncommon, in this country, for them to start kicking off by nine o’clock when conditions are right. What many don’t appreciate is that the development and the movement of thermals it is also dependent on wind. Therefore they may be long and thin and form ‘streets’, sometimes visible as a long cumulus cloud parallel to the wind direction, highly prized by glider pilots, moving downwind, or isolated circular pockets under a little fluffy cloud, so you can find yourself on the edge of one which, in some instances, can be worse than actually being in the thing as the air is much more unstable in this area. What they all relate to is the heat source feeding them and the terrain. Most meteorological books, apart from those aimed at glider pilots, don’t go into much detail about thermals but all aviation is affected by them in one way or another. There is much debate about the shape of thermals. Some say they are columns of rising air, others that they are doughnut shaped bubbles of rising air or they are large bubbles of hot air that break away from the ground. How they are produced is also up for discussion but basically the darker the surface the better the thermal production will be. This includes everything from woodland to roads but also includes areas inclined to the sun’s rays and which are more likely to be heated, such as hillsides. What is not in doubt is that they can produce very strong up-currents, equally strong down-currents and localised areas of serious instability. My dad always favoured the ‘heated air breaking away from the surface’ theory and to me it makes perfect sense. James Cooper, an Australian glider pilot, very courageously put pen to laptop and has written a rather good descriptive resume of thermals that explains them pretty well, in my opinion. 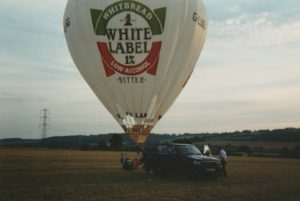 Back to ballooning then. We need to know how to know when thermic activity is starting or, come to that, decaying. 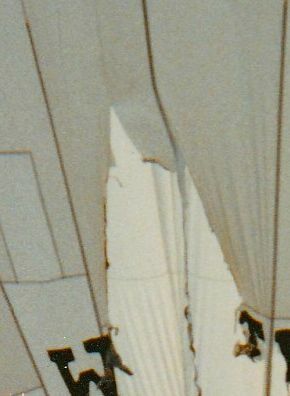 Thermals are affected by the wind but will not necessarily move at the same speed as the wind, so balloons can encounter them and fly through them. Where you are in the thermal is also important, especially for gliders. When gliding its no good trying to chase a thermal and arrive at the bottom of an ascending one. Rule of thumb says that the air at the bottom of a thermal is rough and on the top smooth. If the air is rough, then unless you are very experienced and know how to out-climb a thermal, then its best to move on and look for another one. As the day warms up the thermals develop and the bubbles get joined together and they become much more like columns, which makes it easier. The science is complicated but both thermals, and the clouds that form above them, can become self feeding which is why we balloonists should be on the deck before they get going. So we are talking early doors thermals and, as such, they won’t, or shouldn’t, be developed. This means we can usually see or feel their effects. We need to learn when to land. When thermals break away and rise then an area of relatively low pressure is formed below that is filled by the surrounding air being drawn in. This manifests itself early in the day as eddying winds, so very localised changes in wind direction is the most likely effect on us making landing ‘late’ a bit tricky. Trees and bushes, as they warm up, are good pointers. You may notice the treetops on the downwind side of the trees starting to twinkle and rustle. This could the start of warm air building up and it will eventually form an unstable bubble and break away. Check crops, especially wheat, which is much darker, for squirly patterns running across the field or flags fluttering somewhat randomly. Flying into cooler or warmer air pockets is also a bit of a heads up. Now is the time to be thinking about landing. If you find yourself landing late choose the biggest area you can and make a steep positive landing. If you come down and find yourself in calm, and especially, warm air avoid the temptation to remain airborne and ‘steer’ for a better spot. Get the thing on the deck. Once down deflate the envelope as quickly as possible and stay put until everything has stopped and the envelope is all but flat. It may all seem a rather dramatic and unnecessarily type of landing but there is many a time when, a few moments later, a mighty gust comes through and you will be very happy to have a deflated envelope. A strong thermal will pick you up and drag you given half a chance. Conversely, in the afternoon, when thermic activity is dying out, you can usually tell the strength of the thermals by the periods between the gusts. Sit it out. For inflation and launch there will be a period of calm followed by gusting followed by another calm which will be much longer. Its the long period of calm you want to find. If you are daft enough to go flying into the heat of the day then you need altitude until you find somewhere big and open to land. Near the deck you may need to prevent climbing by playing the parachute against the burner but don’t let the balloon get cold. Make sure the pilot lights are out and your passengers are well briefed. Your landing should be 'an arrival' on terra-firma and, just before you hit, get the parachute or deflation system going and be prepared to get dragged left and right. Now for two tales of daftness. Many years ago Lenny Vaughan asked what it was like flying in thermals. We were at the Surrey Show in Guildford. We’d had a very pleasant uneventful morning flight. It was about half eleven and the day warming nicely. There was broken cloud and little or no wind. “Come on then we can probably get a short flight in and find an early thermal”. I stupidly said. Well it was pretty stable low down and things went well for the first fifteen minutes, albeit on a slightly curvy erratic trajectory. Eventually we found ourselves over a large wheat field. I’d told Len about watching for swirls in the crop earlier and suddenly he pointed at the far corner of the field and made a most appropriate remark. Coming towards us was a huge revolving squirly disturbance. In front was a large paddock. ‘We’re going in there. Hold tight.” We were down to about a hundred foot when we started to climb. Out came the top, on went the burner. We arrived in a heap then the squirliness caught us up and we got dragged in a circle with little or no air in the envelope. “Won’t be doing that again then!” I said with effect. Len agreed. Of course I did, in the misconception that I had an understanding of them and could always dump the plot on the ground should things get dramatic. Probably the balloon I met thermals in the most was the White Label hopper so, the next tale concerns the pictures that accompany this. As a result I very nearly knocked ballooning on the head or, rather, my future in ballooning very nearly got knocked on the head. The flight was from Cardiff Castle and I did everything wrong. We make light of it now, but at the time it was pretty hairy. We’d already had a morning flight and came back for another in the hopper. It was a short hop into some playing fields but I did fly around a rugby pitch before landing so that should have told me something. We got back, refuelled and decided another hop was possible. The sun was out and it was getting near lunchtime. Cloud was forecast later. There was a parachute display due in half an hour. I reckoned I could repeat the hop, cheer up the spectators and we could head off for lunch. The moment I lifted off I started a low level circular tour of the castle then over the adjacent wooded park and tennis courts, chatting merrily to those below, ready to land at the first opportunity, stopped, and then hurtled back to the castle. Stop dead again. Next minute I’m off again. I looked up and saw that the sky had gone all sort of slacky blue grey and the clouds causing it were very high. Concerned about being over the castle with a parachute drop imminent I reckoned the best thing to do was to climb and find a wind to take me away. Next second though I was really climbing, but through no effort on my part. Then I was looking at the envelope without looking up. That was wrong. I let it cool and started down and burnt every time the mouth was sort of above me, no gimballing in a cloudhopper! Eventually things sorted themselves out and I was down to roof height but starting to go in a circle again towards the main Cardiff railway line. There were rows of terraced houses and, amazingly, just before the road bounding the railway, a courtyard of gardens formed by houses. That would do. I landed on a kitchen extension followed by the envelope. Long and short was that I managed to get off the roof. The neighbours sausauged up the envelope and took it through a house, popping it behind the front garden wall along with the bottom end. I walked down to the corner shop, borrowed their phone and called Greg who had a mobile. I cannot say what he said having witnessed the event from the ground. As I sat on the wall awaiting his arrival I watched fire-engines, ambulances and police cars rushing up and down the road. When we got back home we stood the little darling up to check the damage. It wasn’t good, having lost a couple of flying wires and a serious split had started to develop. I wasn’t sure whether I had been extremely lucky or very foolhardy. Both, I decided. What advice would I give about flying in thermals today? Don’t. What advice would I give if you find yourself in one after ten o’clock? You shouldn’t be there. Cameron Balloons - The balloon must not be flown if there is extensive thermal activity, any cumulonimbus (thunderstorm) activity in the vicinity of the flight path, or any turbulence which is giving rise to gusts of 10 knots (5.1m/sec) above mean wind speed’. Lindstrand Balloons - The balloon should not be flown in meteorological conditions that give rise to erratic and gusty winds, which could cause an increase of 10 knots above the mean wind speed. The maximum surface wind speed for take off and landing is 15 knots. Ultramagic - The surface wind speed must not exceed 7.5 m/s (27 km/h or 15 kts). There should be no, or only very weak thermal activity. There should be no sign of storms, either active or building. Kubicek - Balloons must not be flown or tethered if there is thunderstorm or extensive thermic activity, turbulences or another meteorological conditions (e.g. wind shear) that give raise to erratic or gusty wind in the vicinity of flight path. LTL - The maximum surface wind speed for take-off and landing is 15 knots. The balloon must not be flown in unstable atmospheric conditions i.e. thunderstorms. A full meteorological assessment should be carried out before every flight (tether or free flight). The pilot must satisfy himself that the weather conditions are safe and within the limitations of the flight manual for the entire flying period. http://www.wikidelta.com/images/pdf/Thermal-sources-and-clouds-streets.pdf - James Cooper’s very informative missive. http://f4bscale.worldonline.co.uk/Thermals.htm - Interesting info for model glider flying containing some good tips for us balloonists.